Striking Stop & Shop workers line upper Main street in Edgartown. 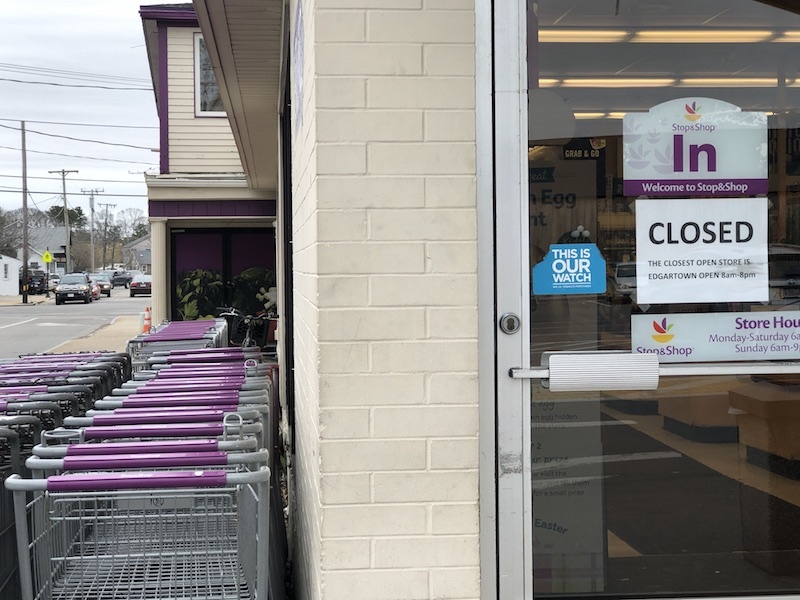 The Stop & Shop store in Vineyard Haven was closed Friday morning following the Thursday job walkoff by workers on the Vineyard and around New England. The Edgartown store remains open, where striking workers are picketing. 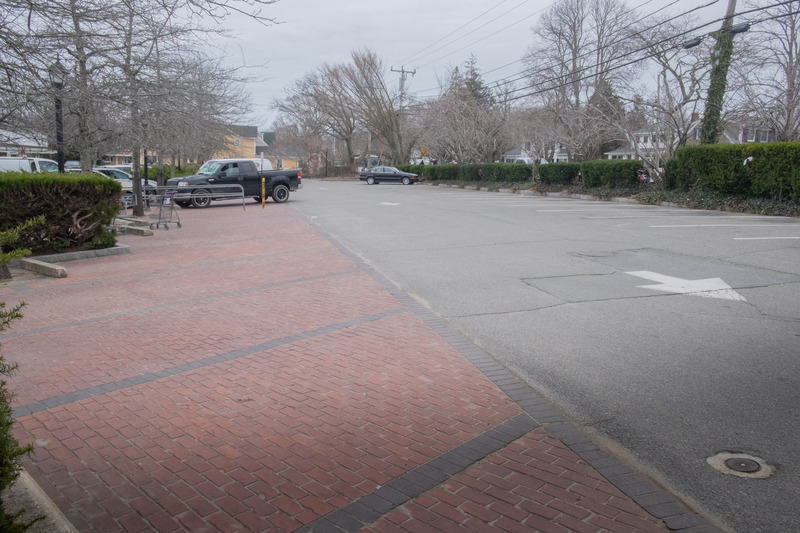 Speaking to the Gazette by phone Friday, Stop & Shop spokesman Jennifer Brogan confirmed that the Edgartown store will remain open — hours have been changed from 8 a.m. to 8 p.m.
She said the store will be staffed with managers and corporate personnel. The Edgartown pharmacy remains open, Ms. Brogan said. All associate-level pharmacy employees are part of the strike as well. Ms. Brogan confirmed that the strike has affected delivery trucks. “I can confirm we did not receive delivery today. I can’t make any projections as to what’s going to happen in the future,” she said. Many of the delivery drivers are part of the Teamsters union. According to union representative Erikka Knuti, Teamsters 25 will not cross the picket line. Stop & Shop workers on Martha’s Vineyard joined their counterparts around New England Thursday afternoon, walking off the job to protest stalled contract talks. The workers are members of the United Food & Commercial Workers union. Union and management have been negotiating a new contract since February. The union voted to authorize a strike last month. Salaries and benefits are at issue. On Thursday employees received notice of the walkout at 12:30 and exited the building immediately after that. “We got to go, we got to go,” a surprised customer reported hearing the workers say. 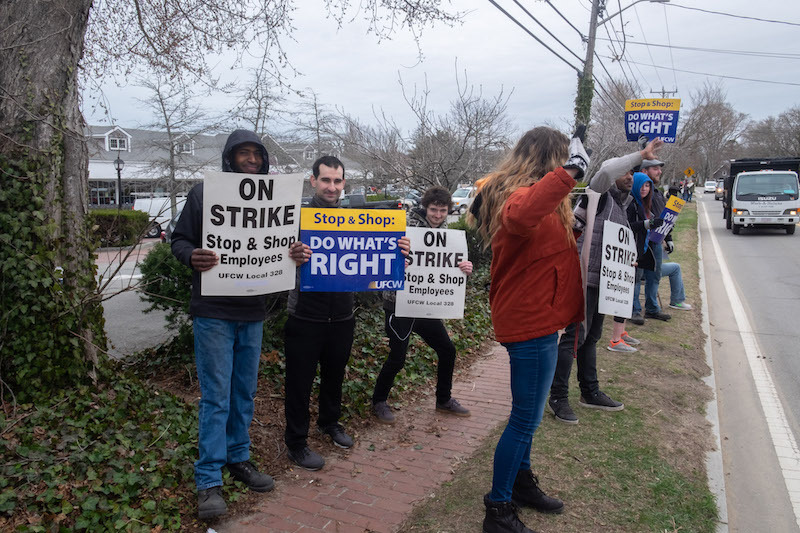 At 1 p.m., more than 30 employees were standing outside the Edgartown store with signs that said “On Strike — Do What’s Right” draped around their shoulders. Drivers on Main street honked their horns in support. A similar scene played out at the Vineyard Haven store. Inside the Edgartown store, a pound of roast beef and a half pound of turkey were the only signs of a deli counter that was bustling with employees and customers less than an hour earlier. Two members of the store’s managerial staff worked the checkout lines, which had grown sizable. “This just happened,” store manager Mary McEvoy said. The strike is taking place at stores in Connecticut, Rhode Island and Massachusetts. On Friday, Ms. Brogan said Stop & Shop will continue to actively workto provide full service customers. “We know and understand the importance of these stores to the community, and are working very hard to service the folks on Island,” she said. Home page picture by Albert O. Fischer 3rd. I'm not sure what the 'negotiations' entail, but when you have no skills and walk off a job you can easily be replaced. All the fat-cat union reps take your union dues with their promises of big raises, but when you strike the amount of money you lose never gets back into your wallet. When you are in a job that can easily be replaced by a self-service kiosk, you shouldn't expect much in the way of sympathy. When visiting an off-island fast food place in a state that mandated $15 per hour for non-skilled workers, there were fewer order-takers at the counter. They had all been replaced by self-service kiosks. Be careful what you wish for. As California Rep. Katie Porter pointed out this week to Jamie Dimon, CEO of JP Morgan Chase, unskilled workers need a living wage until that time when, as he suggested, they could rise up the ladder from the entry level job. She laid out an employee's bare bone expenses (California housing is as expensive as the Vineyard), which was painful to hear, especially when said employee ended up in debt each month. Dimon was mute. I wish for the time of my childhood when people valued other people, irregardless of their education or skill level or earning potential. Those who beep in support see people trying to make a living, not an cog in an economic wheel! Wow, Big Picture, you stole my thunder. "Here we go again" mentioned skill sets, but Jamie Dimon, who made 31 million dollars last year, was not skillful enough to answer Rep. Porter's questions. So, we shouldn't be asking about the skills of the workers, but rather the skills of Mr. Dimon. Rep. Porter's questions were not that difficult. In addition we have to wonder about the skills of the owners of Stop and Shop which is based in Brussels. Simon was skilled not to answer a ‘Gotcha’ questions. The banks pay better than a living wage to their employees. The question should be what do the feds and local governments pay for entry level and non-skilled labor positions. Paulli, you claim the banks pay a living wage so I will ask you a variation on Rep Porter's question. How do you consider it a living wage if the woman getting it is still -$500+ every month? You know what a conversation killing statement is, it's your post. You are correct automation will supplant many many jobs. And yes you are correct these types of jobs will be the first to go. The discussion we should be having is how do we transition society away from the jobs, as within the next 5-10yrs they won't exists. The bottom line is this, our society is highly dependent on these jobs, because last I heard the vast majority of Americans don't live off the land. So until we transition to live off the land again, automate every store, or move people away from these jobs, we're going to have to support people and provide some sort of living wage. Automation will have a impact like the industrial revolution. Yes, the 'transition' away from 'living wage' jobs began many years ago...thanks to the unions who made our manufacturing base flee the USA for cheaper labor overseas, benefiting low wage countries such as China. Look at the clothes you buy. (Look at ANYTHING you buy at walmart... 'made in china' or some third world country will be on the label.) When politicians legislate mandated wages, benefits etc, and unions force further demands, a company either folds since it cannot compete, or moves its manufacturing offshore. Its perplexing that the unions give Democrats their 100% loyalty, then turn a blind eye when the manufacturing jobs disappear to Mexico, and the cheaper goods are allowed to come back into the country free of tariffs from Mexico. They won't recognize the fact that the ONLY President to ever do anything that benefits the UNION workers is Trump. Hate him all you want, but he is the best friend the working man ever had in this country. Not every job is a career and as such does not 'deserve' whatever you call a 'living wage'. That nonsense is called socialism. It never works, and all you ahve to do is look to Cuba. Grocery clerks get the same as a professional. The country is a disaster economically and will continue to be so unless they adapt capitalism. And one more thing about unions, for those of you who never left the rock. They are all about non-competiveness and rewards for doing nothing. If you work in a factory and build more 'widgets'than others, the shop steward comes and tells you to SLOW down, you're making the other workers look bad. When i went to college off-island in the mid 1970's the commuter railroad had deisel locomotives. I think the last coal locomotive was probably used before the Korean war. I inquired as to why the extra person was in the locomotive... the one sitting there drinking coffee and reading magazines. It should come as no surprise, he was the 'fireman'. I was told the job of the 'fireman'was to shovel the coal from the coal car into the engine. Since the railroads upgraded to cleaner deisel, he was no longer needed, but the union demanded he keep that job, rather than be retrained as an engineer. Its called 'union featherbedding'' when you pay someone to do a job eliminated by progress or technology. With the critical public transportation industry the union had leverage and the taxpayers got stuck with a tab for a lazy employee getting paid to breath. Not the case here. And Off-island there are lots of competing supermarkets and people willing to cross a picket line. I understand if you're skilled as a butcher.. but stocking shelves and bagging groceries is not a 'career'. If you don't like it, learn a trade and move up the economic ladder...or try Cuba. If that self service kiosk malfunctions during your busy day who is it that will provide assistance? Another substandard service robot? Years of professional training and priceless experience is irreplaceable. Local 328 does not make wishes for what we deserve, we fight for what us and our families deserve! All workers deserve the chance to negotiate and compete fairly for employment. These workers and most islanders live a humble life and streach their paychecks the best they can. There are great unions that helped make America a powerful nation and brought prosparity and fairness for both the Employers and the Employees. There are Ignorant people who think anyone fighting for a better life are foolish, and those are the nesayers that will cross the picket line. The rest of us will respect these S&S workers and wish them good luck and then we will drive to Cronigs to shop. I hope that Stop and Shop quickly decides to pay their workers fairly so they can back to work. I won't be crossing their picket line so I will be shopping at Reliable and Cronigs until this is resolved. A major inconvenience since I live within walking distance of the Edg store. because they dropped the Island card program, and started their own - free for customers? I agree will not be going to Cronigs..... can’t afford it!!!! I know Steve does great things but come on the prices are killing us! Steve claims he does nice things and we see all he donates etc but he does it on the back of us, the locals and the summer visitors. He makes enough that he CAN give to others. I wish I did. Goin to market basket Save enough to pay for the boat and then some.. Happy to hear that you will not be crossing the picket line for S&S. That will free up the isles and cashiers to get in and out faster. If you can’t afford to live on the island maybe you shouldn’t live here. Payroll expenses and their related taxes increase cost and is passed onto the cost of food. If you want a living wage aspire to be more than a grocery clerk. I do t want to pay more for my food. The island card is a scam! That’s why Cronigs dropped it, IMO.. Here we go, folks. Reality points it’s tricky head above water. The cost of living has sprinted ahead of wages and jobs that would have allowed a modest lifestyle are now poverty level. Automation will shave payrolls down - been through that self- serve lane at Stop N Shop when you just have a few items and don’t want to wait in line? Tip of the iceberg. New gas station at the airport got rid of the gas jockeys. Brave New World arriving and it’s nasty to those at the bottom. I never use the self-checkout line, or self-service gas pumping, unless there is not alternative (sometimes there isn't). Now, *you* are doing the work, unpaid, that used to be done for you by a human being. Pretty stoopid! People need work. People need other people to have work, so they can all interact. Boycott self-service and self-checkout. So sorry you have been inconvenienced BY UNIONS! The union movement in this country is nearly 150 years old and is responsible for the upward mobility that created the great middle class. Wages, health, safety, retirement. Unions have been responsible for all of it. Too many people right now view everything through the lense of how it affects them. It is not about you, sir. I was hoping these guys would wait until Bernie had a chance to change things. I understand healthcare is one of the obstacles. Once its removed from a companies obligation to provide some everything will get better. Even government jobs will improve. Bernies plan to pay for it is cut the military in half and bring back the death tax. Plus increase the social security and medicare cap. Its time we join the rest of the world with single payer health care. It would require tort law also to hold limits to malpractice lawsuits. Its quite an undertaking and it would have to be bipartisan. This isnt just about a pay raise. Nonsense, “Bernie’s plan” would not even come close to paying the 33trillion dollar price tag. You can soak the rich all you want, but the only way to pay for those programs would be to levy taxes on the middle class. If you want what the "rest of the World" has, move there! This country is great because of free enterprise & capitalism. Socialism is a watering down of society. The pharmacy issue is scary. Greatly reduced food supply is concerning. I support the workers and their decision to strike and will get by with what is available from other retailers and put a dent in my dried legumes supply. Not to go off topic here, but imagine this in August. Now imagine it with every food supplier, raw to prepared. And ten times the population. Are we prepared for a major weather event? You don’t even need to believe in climate change! These happen every so often. With little notice. Back to topic: I support the striking workers and hope they get what they need even if it costs me at the checkout aisle in the future. And I don’t make much money, a lot less than most year rounders here but a good bit more than my equals who feed me. I am on their side. Support the workers! Toot your horn in support. Pick up a placard and picket! Do not cross the picket line and stoop down to the level of them skabs working from corporate. And to the gentleman who is dissing these workers as unskilled labor should be ashamed of yourself. Anyone who shares your opinion fails to see that these people work hard serving hundreds if not a thousand people a day. Perhaps you forget where you came from. Every woman and man who go to work to give what ever service they do is of value and so is there time. If Stop & Rob don't pay there workers a fair wage, then these people become wage slaves. It's another way to keep people down which creates a class war. And you know what else? These workers will find other work and they will survive without stop & shop if they don't start paying fair wages. Stop & Shop needs the workers way more than the workers need Stop & Shop. Workers of the World Unite. Solidarity Forever!!!! As the article mentioned, the union truck drivers who deliver to the island are not going to cross the picket line. Stop & Shop will become a shell of itself within days. For those who don't like unions -- cops, nurses, teachers are union members. Do you want our society to try to live without them? Don't like unions? Perhaps YOU should move. Heck, even all those talking heads on Fox News... are union members (AFTRA)! Public employees who are members of a union are not permitted to strike. I hope stop and shop corporate digs their heels in and hires a non-union trucking company and stops doing business with the one that is being strangled by their teamster drivers. Unions are for lazy people. If you cannot perform the union will protect you. Those who want to work and do a good job don't need a union to threaten shut downs and inconvienence citizens who have nothing to do with their labor dispute. I'll cross the picket lines any day of the week. Ask the 'rust belt' of American, all of the industries that used to keep our country humming how well the unions worked out for them? The greedy union bosses grabbed the dues and let the companies move to Canada or Mexico to build cars. The jobs disappeared. If I was a stop and shop executive I'd install more self-service checkout lanes. Problem solved. Red, just curious. You reference nurses as unionized. They are. You are correct. If their union went on strike, would you support them by going to a hospital off-Island if you needed immediate medical attention? I hope the need never arises. but would you? I've been administering a Facebook page that compares prices at our local stores. There are other places besides Stop andShop to shop with your food budget in mind, especially if you pick up items when you're near a particular store you know has decent prices on particular items. Overall, Stop and Shop is consistently the lowest priced store in my experience, but the local farm stands have good buys, too. This strike is very hard on Stop and Shop customers who need to shop there to take advantage of their lower prices, especially the weekly specials. For example, I saw avocados priced at $3.49each at one store, $2.49 at another, and then saw them at $1.00 at Stop and Shop before the strike. Vineyard Grocer offers a 10% discount for prepaid memberships, and on Thursdays they offer an additional 10% off with the Island Club card. Ghost Island Farm which is open this weekend, also offers a discount on their already reasonable prices. Morning Glory, opening in a few weeks, will be offering their own loyalty card this year for discounts and specials. If it's okay with the Gazette, I'd like to post the name of the FaceBook page so readers can join and have more pricing and availability information: MV Grocery Price Comparisons. Anyone can join and it's free and people are encouraged to post the prices they run across all over the island. We don't compare off-island prices, although it's tempting! Also, I will not be crossing the picket line to shop at Stop and Shop, but I understand there are people who need to. Please don't try to shame anyone for crossing the line because they need to feed their family. I just returned from Reliable. It was as busy as summer. Island people were showing their support with their feet. It's just a matter of time and Stop and Shop will close the Vineyard Haven store and just have Edgartown,can't blame them if they do close there doors the treatment they received from our Selectman and MVCommision was deplorable.Its called competition in the business world and yes it will drive prices down and keep them in check we loose it we will all pay dearly.And just one question how is the Edgartown project going on its New Stop and Shop?I believe it was to start a year ago,well maybe I'm wrong but maybe both stores will close up if we can't start working together on these proje cra and think of the consequences it will give us.. Didn't the gazette publish a story about a lawsuit from an abutter in Edgartown with respect to the expansion that will basically slow down the process? As usual, just tossing a 'monkey wrench' into well thought out plans from a year round business that we all depend on. I hope you're right about closing the VH store. Then the VH voters (who elected the board members that stopped the expansion)can go pay premium prices at Cronigs. I think the VH S&S would be an excellent location for a large multi-unit affordable housing complex. (taking the cue from the purchase next door by steve!) I bet you could stuff 60 families in there.. and their kids will like the schools too! These hard working folks deserve low income housing with a nice harbor view and walk to town so they don't need cars. (green new deal!) Maybe 3, 4, 5 stories tall, it would be the envy of the rest of the country how S&S 'stepped up to the plate' and helped the Island solve its 'housing crisis'. Imagine what a generous corporation could do, without the buracracy, salaries, and politics of a 'housing bank'. Terrific idea. The Halls are blocking the Edgartown store.